UC Irvine researchers are working on a new technology to develop the first patient-specific heart valve with self-regenerative capabilities. 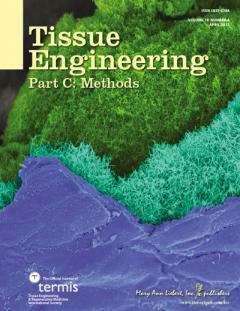 A recently published article entitled “Metal Mesh Scaffold for Tissue Engineering of Membranes” has been featured on the cover of the April 2012 issue of the journal of Tissue Engineering Part C: Methods. In this article, UC Irvine scientists revealed a novel engineered tissue made of an extra thin layer of metal mesh tightly enclosed by biological cell layers analogous to a heart valve leaflet. Hamed Alavi, a graduate student working with Assistant Professor Arash Kheradvar, M.D., Ph.D., The Edwards Lifescience Center for Advanced Cardiovascular Technology, is the first-author of this journal article. According to Alavi, the novel hybrid tissue is expected to be biomechanically resilient against the physiological stresses inside the cardiovascular system and in particular can be an alternative for damaged heart valve leaflets. Engineering membrane-like tissue structures that operate in highly dynamic loading environments, such as in the cardiovascular system, is highly challenging. Despite substantial research in the past three decades, only slight progress has been made toward developing tissue-engineered heart valve leaflets. All the prior methods entail significant limitations due to structural vulnerability, short-term functionality and mechanical properties of the membrane constructs. To overcome these issues, Alavi and Kheradvar developed a novel hybrid tissue, which retains all the advantages of using biological scaffolds while developing a strong extracellular matrix expected to stand various types of loads after implantation as a heart valve. Alavi and Kheradvar are currently working on the biocompatibility and self-regenerative capacity of the engineered tissue, and if their efforts turn successful, we may anticipate a new generation of heart valves that are patient-specific, which promises a living replacement for diseased valves with the potential to last a lifetime. "I cannot wait to see that day in which this technology is used in patients and helps them to have a better life," said Alavi. Alavi is a Ph.D. candidate in the Department of Biomedical Engineering whose research is focused on this topic.